Volume 8 of Kodansha Comics’ English release of the Sailor Moon manga hit stores yesterday. You can pick it up from many comic and book stores or from Amazon at the link below. These books will also be available on the sidebar of the main page. Ordering from these links will help support the site which is greatly appreciated. 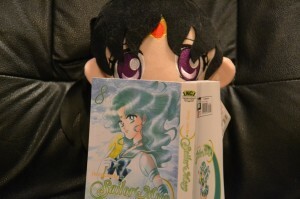 This volume has the lovely Sailor Neptune on the cover. In this book we see the conclusion of the “Infinity” arc involving Sailor Saturn and Mistress 9 and move on to the “Dream” arc which introduces us to Pegasus. Keep reading for a few photos of the inside of the book. Rika Izumi, who was formerly known by her stage name Hama Chisaki when she appeared in the live action Sailor Moon show as Ami Mizuno, has a new drama series coming up. The show, who’s Japanese title 恋するハエ女 translates roughly to “The Fly Girl in Love” or “Worthless Woman in Love”, has Rika starring in a minor role as Arisa Mita (三田有紗). A character diagram appears at the official site showing Rika’s character to be competing for the affection of the main character’s fiance. This six episode series will be airing on NHK Tuesday nights starting on November 6th. 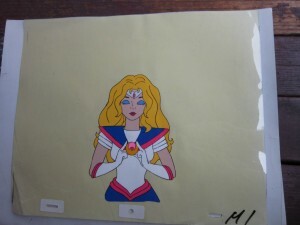 More and more cels from the Toon Makers’ Sailor Moon show (known to many as Saban Moon) have been popping up on ebay giving us a look at many previously unseen characters. Now we’ve got a look at Queen Beryl, Tuxedo Mask and a monster which looks suspiciously like the monster that fat alley cat and Rainbow Crystal holder Rhett Butler turned into. Queen Beryl looks just weird. She doesn’t look human, though the original Queen Beryl has no non human features. Her skin is blue, which is just bizarre. Her shoulders are excessive and she just looks angry! 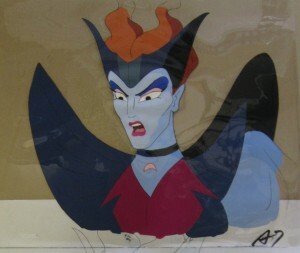 Many auctions for cels like this one are selling for $99.99. 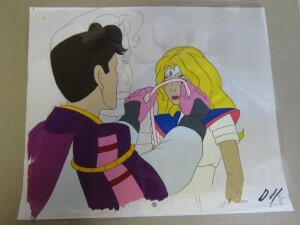 A lot more new cels from the Toon Makers’ Sailor Moon show have surfaced on ebay. This show which was only ever made into a single episode pilot and has only been seen in this short clip, is infamous amongst fans. We now have a great look at Queen Beryl’s ship from the Toon Makers’ Sailor Moon show. Ever know Queen Beryl was in the show? Ever know she had a ship? It can be seen in this Toon Makers’ Sailor Moon cel auction. Here we have a look at “The Dark Galleon” which is Queen Beryl’s nasty looking ship previously seen only briefly in the online clip when it shoots a laser at another ship, destroying it. We know this name because in the script we talked about yesterday the Dark Galleon was mentioned as being Queen Beryl’s ship (it’s on page 3…). SUDDENLY THE DARK GALLEON OF QUEEN BERYL APPEARED ON THE HORIZON AS HER FORCES DESCENDED ON THE GATHERING IN A BRUTAL ASSAULT. What a cool looking ship! 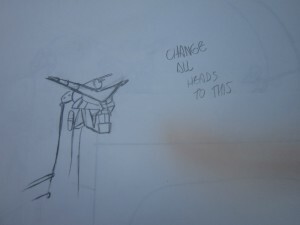 One sketch included in this auction even mentions “CHANGE ALL HEADS TO THIS”. What heads? Maybe there were other sketches with different or no heads? Maybe some other object has … multiple heads? Who knows! 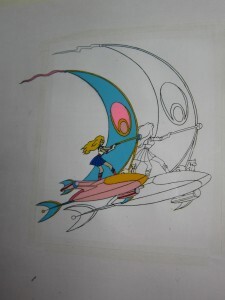 The auction also comes with other cels and refers to the show as “Project Y”, a name that also appeared on the script. 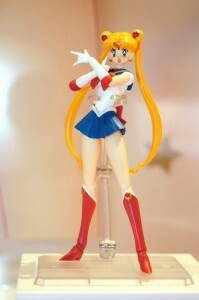 Bandai has announced a few new Sailor Moon figures at their Tamashii Nation 2012 show, which is Bandai’s collectible trade show. 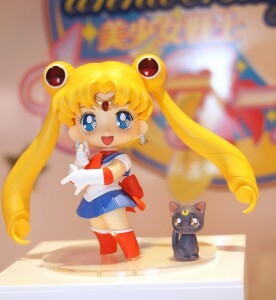 Two Sailor Moon figures were shown. The first was part of the Figuarts line. Figuarts are high quality very detailed figurines with swappable parts. As can be seen from the two images shown below Sailor Moon can be posed in a number of ways such as her “I will punish you” pose from when she lectures villains to her post transformation pose. 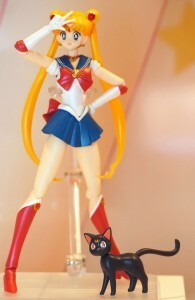 Sailor Moon comes with her faithful cat Luna. The story of the Toon Makers’ Sailor Moon show, known to some as “Saban Sailor Moon” or “Saban Moon”, is a long and fascinating tale in what could have been. Basically in 1994 there was a plan to make an American Sailor Moon show featuring a mix of live action and animated bits that was something like Power Rangers meets She-Ra. The whole history is long and complex, most of which can be inferred from this article which shows it to have been a project by Toon Makers’, Bandai and Renaissance Atlantic. I’d love to go on explaining this at length but I will leave that for another time. 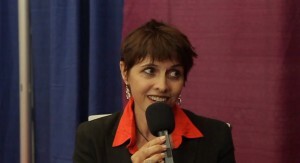 All that has been available of this to date has been this short clip which played at a convention years ago… until now! 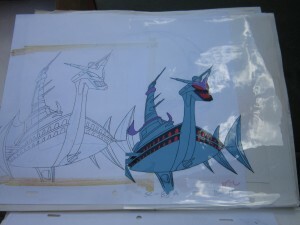 Cels used in the original pilot episode of this show have surfaced on ebay, which constitute by far the best quality images of this show that have been found online to date. You can easily find the remaining cels by searching for “toon makers sailor moon” on ebay. I’ve purchased a number of these cels and once I receive them I’ll be sure to share better pictures with all of you. Interestingly enough a lot of these cels are from scenes not seen in the short clip which has been made available online. Akumu-chan, the new show starring Keiko Kitagawa from the live action Sailor Moon show, has now aired it’s first two episodes. If you, like me, don’t live in Japan and don’t understand Japanese, you can download the show and English subtitles from D-Addicts. If you keep an eye out on that site’s torrent page and subtitles forum you’ll be able to get the rest of the episodes as they are released and eventually translated. You can also watch the show on Crunchyroll for a price. New episodes air Saturdays in Japan. Since this is a Sailor Moon site I won’t be talking about this show on a weekly basis but wanted to give my thoughts on the first episode and the show in general. Overall I think it’s pretty good and that Keiko does a great job. I’ll likely be checking out the rest of the series, something I haven’t made an effort to do with her shows since Mop Girl. 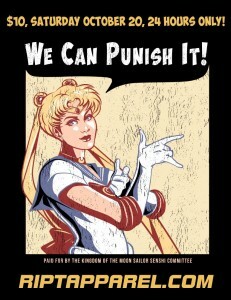 Tomorrow (as of this article being posted) this “We Can Punish It!” Sailor Moon themed t-shirt will be going up for sale for just $10 at Ript Apparel. This shirt will only be on sale for 24 hours after which time it will be gone … forever! I became aware of this sale through Ript Apparel’s newletter. This is confirmed in the ad shown above which is on the artist’s facebook page. 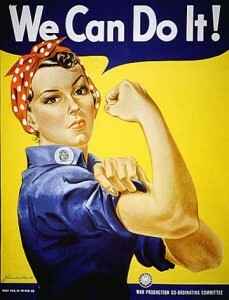 This shirt’s design is a reference to the “We Can Do It!” World War II propaganda poster by J. Howard Miller. This shirt was designed by Ninjaink. A Sailor Moon fan has recorded a part of the Kodansha Comics USA panel from last weekend’s New York Comic Con which includes the portions relevant to Sailor Moon. The video embedded below has been cued up to when the Sailor Moon discussion begins. 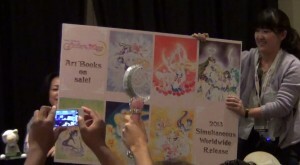 This panel began with the announcmeent of a new Sailor Moon art book for 2013 that we previously discussed on the site. This art book is being put together in Japan and the details are sparse. The Sailor Moon manga box set was then mentioned. These are not new versions of the books, though typos and errors are corrected with reprints so some minor issues may be corrected in these. This followed with a reading of a letter from Naoko Takeuchi to American fans. Thanks to Senshi_chan for recording the video.